RF101: Broadcast Terrestrial Transmission Systems course is an introductory survey of the RF fundamentals needed to successfully monitor a broadcast facility. The course is targeted to those with minimal or no background in RF and/or are relatively new to the field. It will also serve as a refresher for more seasoned engineers. Many come to the field of broadcasting from varied backgrounds such as IT, electronic technicians or military vets, and find themselves immersed in the complexity of a broadcast facility needing to understand and work with the RF end of the system. This multi-module course will present an overview of RF needed to understand the basics and make informed decisions. RF101 modules will be presented in eight 1 hour 15 minute webinars. This first webinar, Module 1, Terrestrial Transmission Systems course, Introduction to Radio Frequency (RF) includes: Definition of RF and Electromagnetic radiation and spectrum, Electric and magnetic fields. The Inverse Square Law and Attenuation of EM waves, Frequency bands and RF wave characteristics, Units of Power; dB and dBm, History of RF, and Safety issues introduction: Exposure and limits. Upon completion of the entire course, attendees will be able to 1) Understand the basic characteristics of RF and electromagnetic radiation; 2) Describe different types of transmission lines, antennas, and their characteristics; 3) Understand the fundamentals of RF propagation; 4) Understand modulation and different modern modulation methods; 5) Describe various components used in RF communications systems; 6) Explain the basic characteristics of RF transceiver systems; 7) Define common terms used to characterize RF systems; 8) Understand how to perform a range of basic RF measurements; 9) FCC regulations pertinent to maintaining a broadcast facility. Instructing and the creator of the RF101: Terrestrial Transmission Systems course is Dennis Baldridge, CPBE, 8-VSB, AMD, DRB, CBNT, a veteran of the broadcast engineering field for more than 30 years. Baldridge is a Senior member of the SBE, holds an FCC Lifetime General License (formerly a First Class FCC License) and Amateur Radio Extra Class License (K0DB). He also holds a M.A.E. and teaches science courses for Upper Iowa University. As owner of Baldridge Communications, LLC, he works as a contract engineer and has also authored articles for Radio Guide. Baldridge serves as an inspector for the FCC Alternate Inspection Program of the Wisconsin Broadcasters Association. Registration for each module will be done separately. Click Register Now below, to register for Module 1. 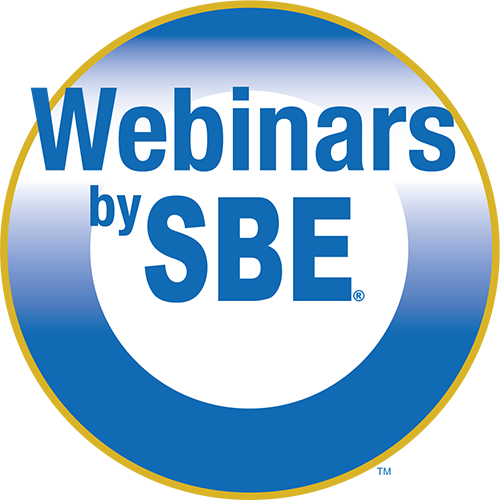 All SBE webinars, including new webinars presented in 2019, are included at no additional cost for members who renew or join using the $175 SBE Member Plus membership option. Through this option you get access to all archived SBE webinars and any new live webinars SBE presents through March 31, 2019, all for no extra cost. Members can renew and newcomers may join online at the SBE website using the SBE MemberPlus option.